Mooncake festival is around the corner and it needs no introduction. My Mooncake making is possible due to the fact that i have a very thoughful and generous friend, who is also 'my sifu' in cooking matters. TT, took a trip to Vietnam and bought mooncake moulds from there and graciously send me some of those lovely moulds, of which these lovely mooncakes turned out. Thank you, TT for making it possible. I hope i did not let you down. 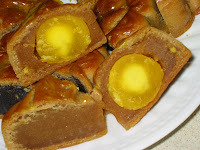 My mooncake making will not be possible if i did not have this recipe which was shared by Wendy. Wendy, wherever you are, thank you so much for sharing. Mix golden syrup, oil and kan sui together and let it sit for at least 1 hour. Boil 600 gm of lotus seeds with 1 tbsp pottassium carbonate & sodium bicarbonate solution(kan sui) for 10 minutes. (Test to see if skins can be removed easily). Cool the lotus seeds and remove the skins and cores. Using the pressure cooker, steam the lotus seeds for 15 - 20 minutes. Put the lotus seeds in the food processor and blend till smooth and pour into a large microwable bowl. Put 1 cup of oil and 150 gm of sugar in a cooking pan and cook till sugar is golden brown. (This must be under a low fire otherwise the sugar will get burnt) When the sugar is golden brown, put in together with the blended lotus seeds and the rest of the sugar. Also add the maltose and another 1/2 cup of oil. Cook on high for 10 minutes, stir, and continue cooking at 3 - 5 minutes, stir when time is up. Cook until paste is nearly done, then add in the remaining 1/2 cup of oil which has the wheat starch. Continue to cook until done (The lotus paste is ready when it is thick and does not stick when tested).Add in the melon seeds and kernels of olive seeds and let it cool before using. Put red beans and enough of water to cover the beans in the pressure cooker, cook uncovered for 5 minutes and then drain. Put back the drained beans and enough of water in the pressure cooker. Cover and cook on highest pressure for 30 minutes. Remove cover when there is no more pressure. Take a container and fill 3/4 of it with water. Place some cooked red beans in a sieve and place the sieve at the water surface of the container. Knead and sift the red beans. The food of the red beans will separate from the bean coats/shells and sink to the bottom of the container. Discard the bean coats and continue this process till all the red beans have been mashed and sifted. Place this watery bean food in a muslin cloth sack or tea cloth and squeese out the water. Continue this process till the water from all bean food has been squeezed out. Add in the rose jam if using. Divide mooncake pastry to 35 -40g (big moulds)and 15g (small mooncake moulds). Knead each portion for a while and roll into a ball . Divide mooncake paste to 120g (for big mooncake with yolks) and 30g (small mooncake), 140g (big mooncakes without yolks). Knead each portion a little and form each into a ball . Lightly flour (using cake flour) your hands. Flatten a pastry dough to a 2.5-inch disk/circle. Press to make the edges thinner than the central part and place a ball of paste. Start pushing the paste against the dough . As you push the paste, the dough will start to enlarge. Press the centre of the paste lightly and place an egg yolk there(salted egg yolks should be cooked by addng in a tbsp of wine and steamed). Continue to wrap up the mooncake until the pastry fully cover the filling. Roll into a ball. Lightly flour the mooncake. Place mooncake, seam side up, in mould. 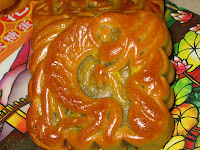 Flatten mooncake to conform to shape of mould . 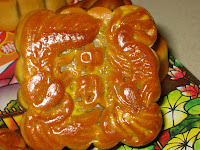 If using a wooden mould, bang upper, lower, left and right sides of mould to dislodge the mooncake. For plastic moulds, just bang slightly the sides of the mould and the mooncake will dislodge with ease. Place cake on to a lined baking sheet (i use silpat/silicone baking liner). Repeat to shape remaining mooncakes. Put the mooncakes in the middle of oven and turn on the broiler/grill/upper heat and broil for 5 minutes or until evenly brown. Remove mooncakes from oven and set aside for 10 minutes. Remove from oven and switch setting to oven 375 f convection. In the meantime, prepare egg glaze. Beat an egg slightly. Add 1 tsp oil and 1 tbsp water. Strain the egg mixture. Brush with egg glaze . Stand for further 5 minutes before returning mooncakes to oven. Remove from oven and let is cool in the baking sheet before transfering to baking rack for further cooling. Store for 2-3 days. Mooncakes will get set and the pastry skin will be shinny and soft and ready for serving. I can't believe you made these!!! These look awesome! Gosh makes me really wana try since i bought the molds a few years ago. But, what is potassium carbonate and sodium bicarbonate? Is it something I can just buy at the stores? Dear Lily, I have been lurking here for quite a while but decided to... uh... emerge from the darkness? =) I've never seen anyone use the microwave to cook red bean paste and you're very ingenious and I feel inspired to try it out. Thanks for your generosity in sharing all your great recipes. Thank you! BTW, what's the shelf life of your mooncakes? A friend of mine said that if you don't make them right, they'll go bad in 3 days and there's some special ingredient you need to use if you want them to last longer. i don't know what is put to in to prolong shelf life perhaps benzonate(perservative). Could you please tell me what rose jam/sugar is? Where can I buy it? Can you tell me if kan sui is the same as lye water? Thank you. kan sui is in cantonese for potassium bicarbonate and there are recipes which will use - lye water or alkali water, they are the same. i substitute maltose with honey and, obviously it wasn't to my liking. the lotus paste taste really strong of honey! could u please tell me how can i get rid of the honey taste? i don't really know what honey you used that was so overpowering. now perhaps you would have to add in essence like pandan paste. may i know what is the purpose for alkaline water? as i can not get any here! Could i omit it? Or is it a MUST to have it? the alkaline water in the pastry acts as a leavening agent which makes the pastry soft and the one in making the lotus paste is enable the skin of the seeds to be removed easily. you can sub with baking soda but you would have to add more, like 1 1/2 times. 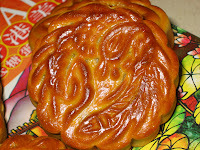 Thanks for sharing your beautiful looking moon cake. I baked a batch today, a few cracked during the last 5 minutes of baking. May I know how to prevent this? the mooncakes were overbaked that is why it cracked. if a few cracked, then your oven has hot spots. you should be able to see if the cakes are cooked, remove them before they crack. Thank you for making time to reply! Your assessment is right! I did over baked cos wanted to have nicely brown moon cake. May I know how can I achieve color like yours w/o having to add dark soya sauce. I would like to know why the mooncakes skin looks sort of cracks after baking the 2nd time? cracks on mooncakes are caused by overbaking. the filling gets so heated up that it cracked the skin. I would like to know how do you store your mooncake. Do you put them in a container or just leave them in the cooling rack for 2-3 days? Please advise. Thanks! it depends where you are, if you are in the tropics or places where humidity is high, leave on cooling rack lightly covered. 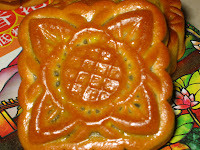 can I use the lotus paste that comes in cans or are they too loose,if so,is there anyway to make them solid like the moon cake buy from bakery. just recived my moon cake molds in the mail today.trying to find a short cut. happy full moon day to you and your family. i have not bought the canned lotus paste before but i am sure you could alter the texture. Put the paste in a large microwable bowl, add 1 tsp maltose, add 1/4 cup oil and 1/4 cup water. Microwave on high for 3 minutes and stir very well to combine. Feel the texture, if it is too wet, continue to microwave for another 1 or 2 minutes. the paste will stiffen when cooled. your advise on adding water and oil was good.but I think water can be left out.with water added it got even looser.the oil was a definite yes, now the paste has a nutty aroma it lack before.my golden syrup is very thick.is that how it should be?when first add sugar and water and lime juice to pot for boiling,can I stir the mixture? thanks Lily for your help. like i said, i have never used the canned lotus paste before, so i was just giving a long shot. the golden syrup will turn thicker as it matures. you can always put it back on the stove with a little water to thin it down. I just finished making the golden syrup - does it need to be refrigerated if I won't be using it for a few days? Since the mooncake recipe only uses part of the syrup, how long can the remaining syrup be stored? Thanks! Could you also post the green bean paste (mung bean paste) made with mung beans instead of lotus seeds? I really prefer the mung bean paste in texture and taste. I am looking at the preparation of Red bean Paste for the red bean bun, may I know what's the volume of the cup used for the peanut oil? I got a bottle of maltose that I bought in order to do mooncakes. And now it's sitting in my pantry, I've got no idea what should I use them for. Do you have any recipes like steamed cakes which I can use them? Please advise. i use maltose for the filling to make kai chai paeng. They are used to make a bath for roast/fried chicken or duck and in the good old days when candy is not so popular, you can twirl maltose on a bamboo skewer like a lollipop. I have just tried cooking the lotus paste. But the texture seemed to be very soft and does not stick together. The paste was not very finely blended. It is a little nutty, will this affect the texture and not able to hold them together. Any solution to improve? Hope to hear from you. Many Thanks. could you email me as to the steps that you have taken to come to this situation. the only suggestion is add in some water, pass the paste through a sieve and cook it again. Thanks for your mooncake recipe.I tried it out. I cheated a little by getting pre-made lotus paste. I just added a bit of oil to it and heat it in low heat. The skin tend to crack a little but not too severe. I think I need to leave it a couple of days for the skin to soften. yes, these type of mooncakes has to be left to sit for a couple of days for the oil to soften the pastry. hello, would like your advice on some problems i encountered. 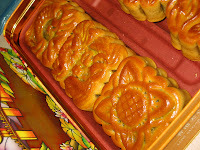 after baking, there are some white patches on the mooncakes resulting a mouldy look. what could be the cause? i also realise the dough was rather oily while shaping. any remedies? thanks! 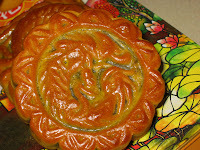 the white patches are caused by using too much flour to dust the mould and your hands while shaping the mooncake. It will be ok after a day or two of sitting, as the oil will soften the pastry and the white patches will not be visible. Yup,left the mooncakes for 3 days and the skin has soften. Having said that ,eating it fresh is a nice experience too because the texture is bit crumbly and the lotus paste will just melt in your mouth. Hi Lily, your mooncakes are very nice. The salted egg yolk you used is huge and the colour is different from the ones we get in Singapore. Here the salted egg yolk tends to be more orangy color. it's only in pics that the yolk looks good. i have to make my own salted egg yolks from chicken eggs cos the duck eggs here cost a bomb. I wonder what is used to make the yolk orange? my friend said that 'kan sui' will do. Just want to ask regarding the golden syrup - do I have to make it like a year in advance or a day before I make the mooncakes or on the day itself? Am a bit confused over this as was told tht syrup need to be prepared a year in advance. i was searching all over the place for my mom who is interested in making the lotus paste as she is diabetic. how glad to have found this. now we can try to substitute with diabetic sugar. however, i was trying to understand, the recipe to make the lotus paste call for 600 gm of sugar. in the cooking method, one cup of oil is cooked with 150gm of sugar. where and when do i used up the remaining of 450gm of sugar? i may have mussed out somewhere. could you kindly advise me on the sugar part. instead of microwave cooking, can i do the same on the stove with the same timing or need more time and medium fire. thank you for letting me know that i have left out the rest of the sugar. It should go together with the lotus paste when you start cooking. yes, you can use the stovetop but you would have to stir and stir until dry as it burnt easily. my family and i often find mooncakes too sweet and oily. how much of the sugar & oil can I reduce to still produce a decent mooncake? sugar and oil are a necessity for good mooncake fillings. They can be reduced by not by too much otherwise the filling will not bind. Try by reducing by 100gms. I see "pigs" in the picture. Are these made with leftover mooncake dough? If yes, how do you make them? 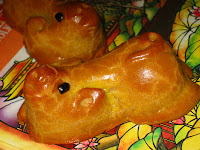 I have been trying to get the recipe for "chu shai loong"...the pigs in basket that are available during mooncake festival. there are moulds to make these piggies. you can have fillings for the bigger piggy moulds or no filling for the moulds that are more flat and they come in the design of piggy, fish etc. I do not have facebook acc, took me some time to feedback here. Many many thx, I have made the attempt to cook the lotus paste in stove, I half the volume and took 40 mins, tedious but fulfilling cuz it is cook w diabetic sugar. My mum could finally enjoy her mooncake. It has been many many years since get to eat one whole mooncake. Surprisingly this is my first time on all steps. No doubt v difficult for small amount of skin to wrap a big filling, practise does make it better, so the first group is terribly ugly. Ha ha.. We notice it is still ok to reduce oil of skin. Are the melon seeds the ones that have a black edge and I will need to shell them myself? And how does the kernels of olive seeds look like? Will I find it in the snack or dry goods section of chinese supermarkets? if it is available in your chinese supermarket, then they are all shelled. The olive kernels are called lam yan in cantonese and they are about 3/4 inch long. I have not seen any of these seeds in my asian stores here. Omit it if not available or use almond flakes or slivers for some bite. Why do you add wheat starch to the lotus seed paste? wheat starch is added to give body and shine to the paste. Some recipes use all purpose flour. How to make black sesame paste? I couldn't find it even in cake shop anywhere. Wash the black sesame seeds and drain and dry them well. Roast them by pan-frying on a greaseless pan until fragrant. Using a coffee grinder, mill them to powder. Thanks for the mooncake recipe and know how. I made them and they tasted great. 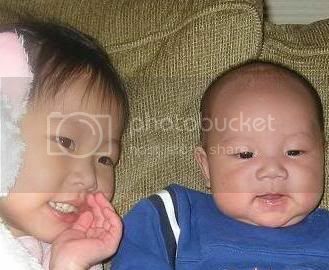 Unfortunately, my American born children have not developed a taste for lotus paste yet. Do you know if a custard filling (similar to the Chinese egg custard buns) will work for mooncakes? Have you experimented or know of such a filling recipe? Hi! Lily, for the preparation of pastry skin you used 1 tbsp potassium carbonate and sodium bicarbonate, is this ingredient comes in powder or liquid? I live in United States may I know where can I get it? hi,i would like to try out the red bean paste recipe for my chinese red bean pancake (the kind u serve during wedding dinners). Can i ask why you use so much oil? I saw a site that involved heating up some oil, melting the sugar and adding the blended red bean paste. Would this work if i don't do it in the microwave? yes, it will work in the microwave, use as little oil as you wish and cook in the microwave until it is dried. for the red bean paste recipe, if i were to do half the recipe, do i cook it in the pressure cooker for half the time? Can i blend the red beans later using an immersion blender instead of passing it through a sieve? whether it is full recipe or half, the time to soften the beans is the same. You can just blend the softened beans with the immersion blender and do not pass through the sieve if you do not mind having a not so refined filling. What if I want to use green bean instead of lotus seed, is it possible just to subs Lotus seed with skinned green bean? and if I skipped alkaline water, what will happen? or is there any replacement for alkaline water? if you want to use mung beans, use the mung beans that have no skin. Soak them, steam them and cook like you would for lotus seeds. May I know when shall I add the 90 gm of plain flour to the red beans paste. Is it together with drained bean food, 1 cup of oil and sugar? Is a heaped tbsp of plain flour to be taken from the 90 gm plain flour or additional of it? Hope you understand what I mean. Sorry for asking so many question. This is my first time cooking mooncake paste. thank you for letting me know about the typo. sorry for the confusion and i have amended the error. add all the 90 gm flour to the 2nd cup of oil and add in according to the instruction. yes, lenny, all mooncake pastes are supposed to be super oily. Before using, try and knead the paste so that the oil will be inorporated. Hi Lily, I used your mooncake skin and it was successful, I just need to add more flour so the imprint doesn't melt too easily after baking. However, I have question about storing the baked mooncake. How long can you store them in room temperature? My mooncake skin start to get moist and a bit mushy after a few days. I tried to put some silica gel pack in the container but it doesn't help much. Stick them in fridge help dry them again. But I would like to know typical storing duration so I won't make mooncake too early in the future, thanks! since we did not use any preservat8ives for our mooncakes, it is best to store them in the fridge after a few days when the skin has turned soft. The skin should not be mushy, if so, it could you have underbaked. Do not put too many in one tray, so that there is enough hot air circulating among the cakes thus cooking them more evenly. i am glad it turned out sucessfully for you. These look delicious and I really appreciate the red bean paste recipe! I was inspired to make my own mooncakes recently, too. The golden syrup was definitely the toughest part, but the entire experience was so satisfying!